Well folks, it looks like the housing market is in the toilet everywhere..... ~except~ for here in the casual gaming world! When I first heard that there was going to be a sequel to the wildly popular "Build-a-Lot" game, I wondered, "What could they possibly do to make it different and more fun than the first game?" Well, I'm happy to say that the answer is, "A lot!" 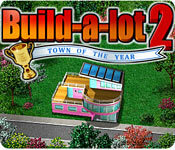 "Build-a-lot 2: Town of the Year" is definitely one of the better new releases out there! Gone are some of the more frustrating aspects (like the tax collector or the need for permits). These have been replaced with new buildings, shops, parks and the option to paint your houses different colors! Whee! Couple this with the new challenge of "Approval Ratings" and you have the makings for building a LOT of fun and just when you think the fun's about to end, there are eight, count 'em, EIGHT bonus levels!! Plus, it's nice to escape to a world where everyone is happy and the housing market is fine... even if for just a little while. You can reminisce about how grand life was... less than a year ago. Check out the guide I wrote for some hints if you get stuck!